If you're in search of a casual yet chic getup, make a black fringe leather open jacket and a tan button skirt your outfit choice. Both pieces are totally comfy and will look fabulous together. Why not introduce Marc Ellis ankle length boots to the mix for an added touch of style? 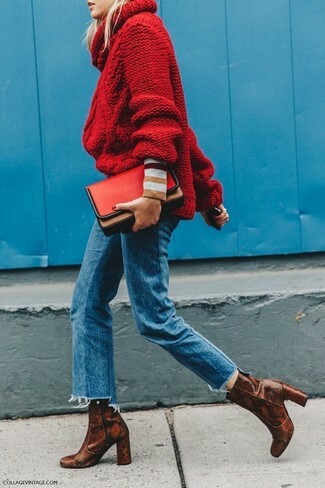 If you're on the lookout for a casual yet totally stylish look, wear a red knit turtleneck and blue jeans. Both items are totally comfy and will look fabulous paired together. And if you want to instantly up the style of your look with one piece, add Marc Ellis ankle length boots to the equation. If you're scouting for a casual yet stylish look, pair a white coat with blue ripped skinny jeans. Both pieces are totally comfy and will look fabulous together. Bump up the cool of your ensemble by wearing brown snake leather ankle boots. If you're scouting for a casual yet totally stylish ensemble, try teaming a blue denim shirt with a white pleated mini skirt. Both garments are totally comfy and will look fabulous together. Go for a pair of Marc Ellis ankle length boots to instantly up the chic factor of any outfit. If you enjoy a more casual approach to dressing up, why not consider pairing a brown shearling jacket with blue jeans? Marc Ellis ankle length boots will instantly smarten up even the laziest of looks. If you don't like spending too much time on your outfits, go for a grey sweater dress. As for the shoes, grab a pair of Marc Ellis ankle length boots. This combination of a dark brown shearling jacket and blue flare jeans is effortless, stylish and super easy to imitate! Let's make a bit more effort now and opt for a pair of Marc Ellis ankle length boots.